Here are some of the 80 some pike I got this year. I also got a new total weight PB at 26.4 lbs and 43" long. I got a 44 1/2 " fish out of Canada 2 years ago but it was a skinnier fish and only 24 lbs. Here are 4 of my bigger fish. Beautiful marked fish Well done. 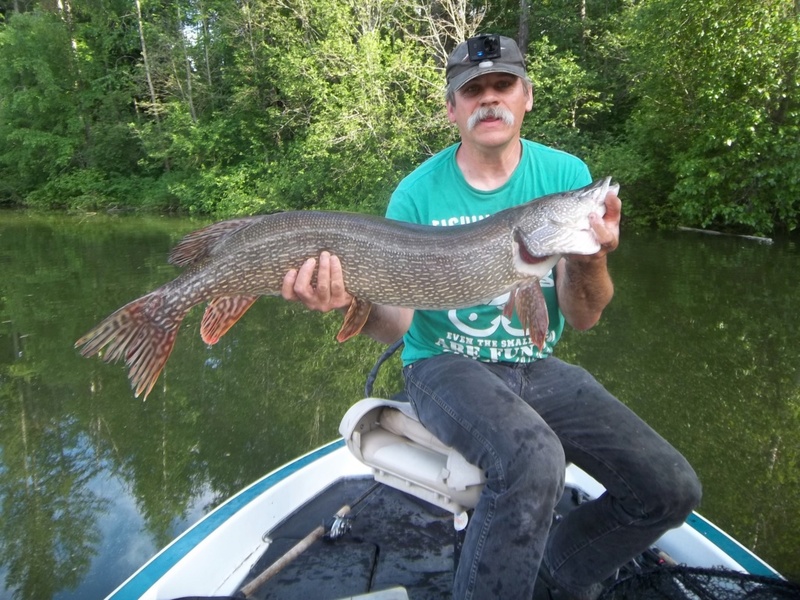 This was actually in early May but I fish lures 12 months out of the year for pike. 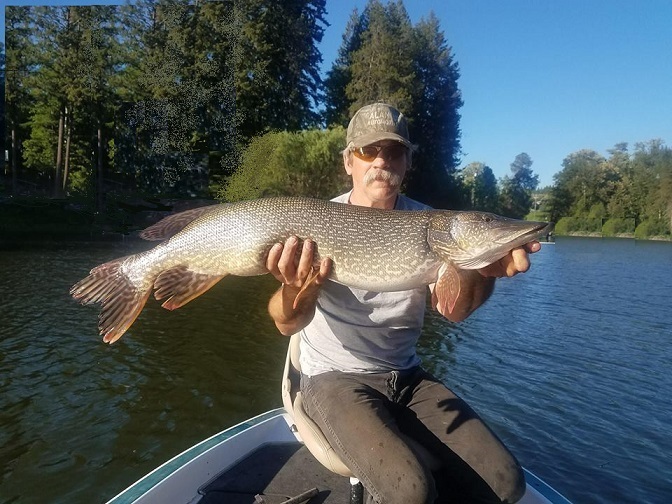 Although it is legal to fish dead baits here, it is looked down upon as a un-skilled and un-sportsman way to catch pike by most serious Pike fishermen. Some guys do use dead baits. The ones I call meat fishermen, they keep and kill every fish they catch. I don't fish dead bait because too easy to injure a fish that way and I can out fish the guys using dead baits 90% of the time with lures. 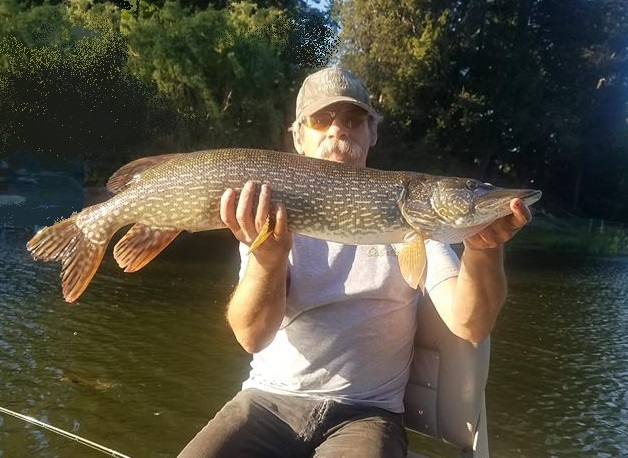 I believe our Pike are a treasure to be cherished, but many of the fisherman here think of them as trash fish to use for fertilizer in their garden unfortunately. A lot of the Bass fishermen don't like them because they bite their lures off. 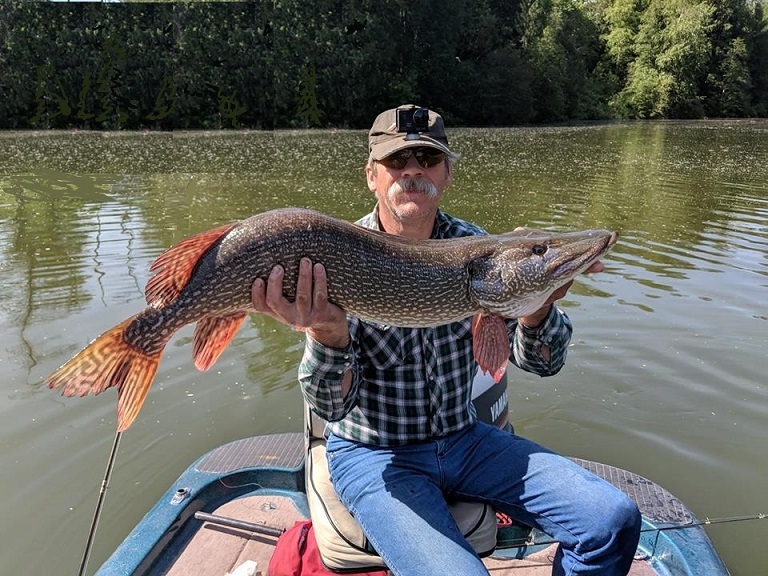 I go out of my way to release every Pike that comes in my boat unharmed and that goes for anyone fishing in my boat as well. , and lures seem to catch the smaller fish , in my case anyway... think my biggest on a lure was about 18lb , but its a case of you can only catch what is in front of you on the day, but I do enjoy lure fishing and keeping mobile , that method will keep you catching fish, and we have our own meat fishermen over here as well , who poach our treasured pike , but most of these are not British and don't respect our rules. I know that dead baiting works and does catch some huge fish. I just won't do it as the risk of hooking the fish deep and killing it is higher than with lures. I think it makes a big difference in how to fish a deadbait and how soon you set the hook. Most deadbaiters in the USA wait till the fish swallows the bait before they set the hook as they plan to kill it anyway. So the lure fishermen get a little testy with them as they hate to see trophy fish killed. You guys could always come to the States for a "Fish In"
I have fished In Canada a few times for Salmon and Sturgeon. I would like to have a go for pike but none of my mates can afford to go. psion wrote: I have fished In Canada a few times for Salmon and Sturgeon. I would like to have a go for pike but none of my mates can afford to go. If only I had that kind of money I need to win the lottery. Well if you could make it here, I have a place you could stay and all the gear needed. All you would need is a little cash for food, gas and a non res. license.